It’s that time of year when the whole, “Why is the Equinox called Mabon?” debate rears it’s ugly head. Like many Gardnerians I’m fairly unimpressed by the name thanks to a whole bunch politics. There are other names for the festival, however, my personal preference is Equinox. It’s a good sturdy name that even those who do not follow my path understand. But On the whole I’m pretty happy to state that it’s each to their own. I thought about writing a nice long academic post about the historical evidence and the modern justifications for calling this festival by certain names. But it’s been done to death by many very eloquent people. So if you are looking for that kind of article may I suggest you start HERE with Jason Mankey’s blog on the subject. For the last few years I’ve been very much about the experiential being balanced with the academic. And that wondrous synergy that can occur when the historical and factual meets the new imaginings of dedicated practitioners of the craft. So this year I thought I’d approach the whole event in a different and innovative manner. Last Winter Solstice I took part in an excellent read along on Twitter #thedarkisreading. In which participants read the enchanting Susan Cooper book “The Dark is rising”. Not only was it lovely to have a reason to sit and read for a short while each evening. It really made me focus on certain seasonal themes. Which gave me an idea. One of the primary sources for the existence of Mabon ap Modron (Great Son, son of the Mother) is the Welsh Medieval tale “How Culhwch won Olwen”. The story is included in the misnamed collection of tales known by most as the Mabinogion. On the surface it’s a rip roaring tale of adventure, knights and valiant kings, brave young men and giants. This epic quest for true love sees the erstwhile hero and his amazing companions travel from the very South of Wales all the way to Cumbria. Performing seemingly impossible feats. Meeting the oldest animals and battling formidable creatures using all the powers and Magick sat their command. It can of course be read just as that, an amazing tale of daring-do, but its a tale of layers. Embedded within are mysteries for those who care to look. Initiations of the body and mind, for those who would immerse themselves ritually into the very tale itself. So this year I resolved to take time reading it to see what wisdom it could impart for me during this season. A touch of meditative bibliomancy if you will. I’ve studied this story many times, as an Awenydd of the The Anglesey Druid Order it comes up a fair amount in the orders amazing annual training course. So I wasn’t really sure what I might get from this exercise being so familiar with the text. But the gods of Land, Sea and Sky never fail me. The first thing that struck me was the sheer quantity of shape shifting that occurs during the tale. Culhwch’s mother Goleuddydd (quite literally daylight) losing her mind in an echo of Rhiannon’s story and seemingly reverting to a zoomorphic state to give birth. Poor Pryderi is linked with a stable in the first branch, Culhwch a pig sty. Perhaps his mother is the very same sow that led Gwydion to the Ash tree from which the young Sun God Lleu Llaw Gyffes hangs between the worlds. 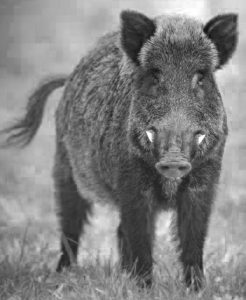 In fact pigs feature very heavily in many of the tales, from the very first branch it is the swine of Arawn slipping into this world that starts the whole story arch moving. Not a mare of sovereignty at all. Is this then an indicator of an older or parallel belief/initiatory system hidden within all the tales? Certainly food for deep thought. And now undoubtedly the focus of experiential ritual in my future. I find this idea particularly poignant as the whole tale hangs on the hero’s relationship to sovereignty. In his case his relationship with Arthur. The kings willingness to trim the youths hair in recognition of kinship is echoed in the demands of the Giant Ysbaddaden. Reading between the lines his only real desire is to ensure an appropriate wedding feast for his Goddess like daughter and to have his hair trimmed using the comb and scissors held between the ears of the great Boar Twrch Trwyth (another pig). Thus effectively regaining his own sovereignty. Interesting huh? Secondly the textual notes to the tale (if you get a good translation) reveals that one of the companions Teyrnon Twrf Liant ( Great Lord, Roar of the flood tide) whose kingdom in Gwent is often associated with the Severn bore. Now I’ve known this for a while, but I’ve never really put much consideration into it. My ritual landscape is primarily that of North Wales. But the Mabon of whom we seek it is claimed was held somewhere along the Severn estuary. He was discovered by the Salmon of Lyn Lliw who travelled the bore every flood tide. So here we have our divine child of the season, in his prison in Caerloyw (Gloucester) but held apparently by the bore. Just as Pryderi was kept by Teyrnon in his youth. And when is the bore at his strongest. At the equinoxes. Perhaps it’s not such a bad name for the festival after all. I rather like it in-fact especially if we were to pair the autumnal equinox of Mabon with a vernal equinox of Modron…..oooo now there’s a thought? This entry was posted in Anglesey Druid Order, Boar, Culhwch & Olwen, General, Mabinogi, Mabon and tagged Boar, Culhwch & Olwen, Mabinogi, Mabon, Sovereignty on September 26, 2018 by Tara.